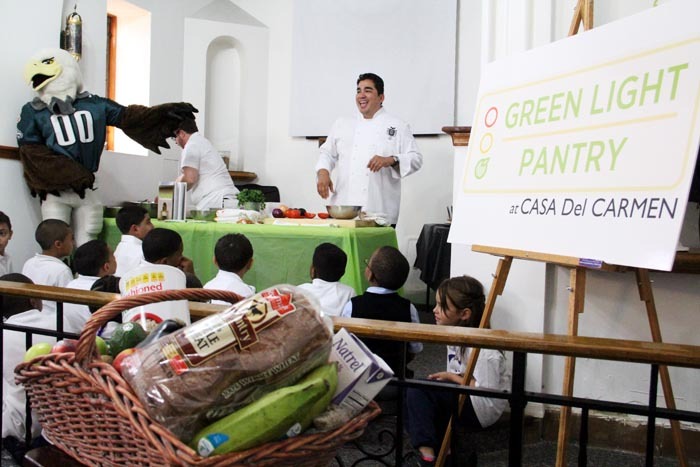 Christina Weiss Lurie, President of the Philadelphia Eagles Youth Partnership, and Jose Garces, award-winning Iron Chef and co-founder of the Garces Foundation, took part in the grand opening of the Green Light Pantry at Casa del Carmen on Tuesday, September 11. The Green Light Pantry at Casa del Carmen, a ministry of Catholic Social Services of the Archdiocese of Philadelphia, is now one of two food pantries in the city solely providing nutritious foods to clients, as well as free nutrition workshops, health screenings and other services. The Green Light Pantry, developed by the Greater Philadelphia Coalition Against Hunger, is focused on promoting healthy eating while helping low-income families put food on the table. It will provide families with foods categorized as “green light foods” under a system developed by the Greater Pittsburgh Community Food Bank, which ranks foods based on their nutritional value and USDA dietary guidelines. Chef Garces performed a cooking demonstration for Casa del Carmen families using foods available from The Green Light Pantry. Children benefiting from the pantry gathered closely as Chef Garces made mexican salsa, gucamoli and granola parafait. Casa del Carmen has served the Latino community of the Archdiocese of Philadelphia since 1954, providing counseling, family support services, daycare and afterschool programs for children. For more information on Casa del Carmen http://www.catholicsocialservicesphilly.org/family_service_centers_casadelcarmen.php.